XpertMart� has the functionality to permit you to do virtually any operation at the Point of Sale. We believe that it is important for a POS program to give you this power. 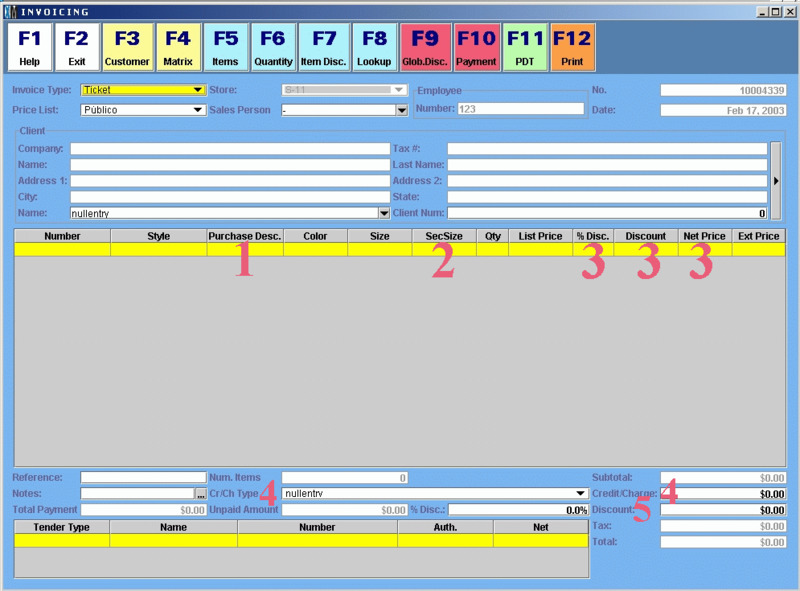 If you want to use all of the options available at the POS then you will find quite a few elements on the POS screen. If you only need some of these POS functions and not others, then you can configure XpertMart� so that it only shows on the screen the elements that correspond to the functions you actually want to use. 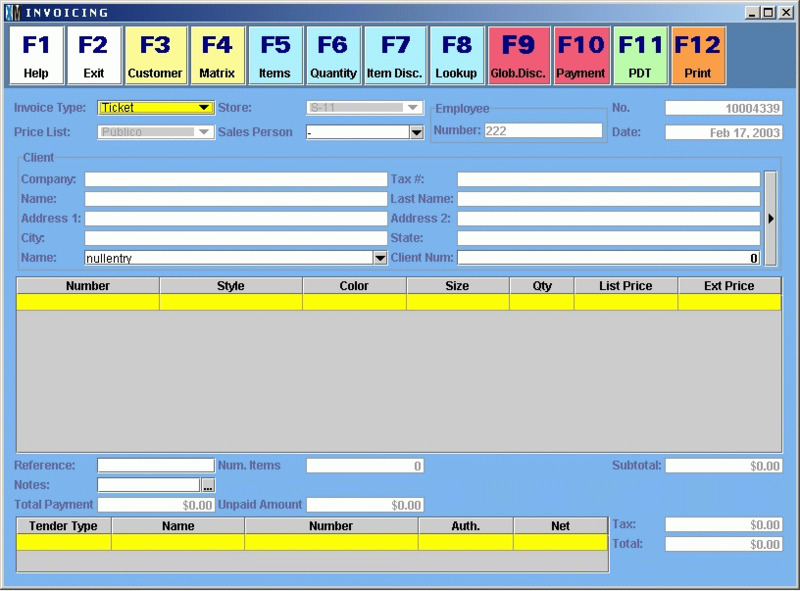 In this screen shot we see all of the POS functionality of XpertMart� enabled. The large red numbers show the elements that can be hidden if you do not need the functionality that they offer. 1) This element is the Purchase Description assigned to a Style. This is a second description after the actual style name. If you do not want to see this element on the POS screen, you turn in off in the Station Configuration. 2) This element is the Second Size of an item. If you are not going to use second sizes or don�t wish to see them on the POS screen, you can choose to not display this in Station Configure. 3) The elements: %Discount, Discount ($) and Net Price allow you to discount a particular item on a sale. If an employee does not have permission to make discounts on sales and you do not allow managers to authorize discounts, these items will not show up. If the employee will be making discounts, then you will need these elements on the screen. Note: In Station Configure, you specify whether managers are allowed to authorize discounts or not. 4) The Credit Charge type and Credit/Charge amounts also only appear if the employee has permission to make discounts on sales. (Because the Credit/Charge amount will be subtracted from the sale subtotal if it is negative.) If the employee is not allowed to make discounts and you do not allow managers to authorize discounts, these elements will not appear on the sales screen. 5) The invoice discount elements %Disc, and Discount ($) will also only appear on the sales screen if the employee has permission to make discounts or you allow managers to authorize discounts. If the employee is permitted to make discounts, he will need these elements to make a discount on a sales invoice. 1) The XpertMart� sales screen displays on one screen all the information that could possibly be printed on an invoice in a form similar to how it would look on an invoice. This makes XpertMart� more logical to learn and use for people who are familiar at least with a sales invoice and what it looks like. 1) Hit <F5> to go to the item entry section. 5) Hit <F12> to print the invoice.